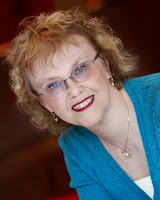 Home > inspirational romance > Weavers of Romance Revealed! *Your hostess for this Clash is Raquel Byrnes. The votes are in and I'm excited to reveal the titles of the two Almost Kiss Clash competitors. We'll find out about the books you voted for and their amazing authors. April Love has always dreamed of being a chef. But she didn’t expect her former fiancé or murder to be part of the recipe for her new job. When April Love signs on to be an in-house chef at an old lakeshore mansion in Canoga Lake, Wisconsin, she comes face to face with her long-lost love, the drop-dead gorgeous Marc Thorne. It doesn’t take long for their old magnetism to recharge, but how can she trust the guy who left her nearly at the altar eight years earlier? Her gut tells her something happened to Marc in between—something he’s reluctant to reveal. When April’s boss is murdered, Marc is accused of the crime. Unless April can find out who really killed Ramón Galvez, her chances for love will end up at the county jail. But someone else is just as determined she not solve the mystery…and will go to any length to stop her. Pamela S. Meyers was born in Ohio, raised in Wisconsin, and spent her early adult years in California. She returned to the Midwest where she stopped long enough to let God catch her. Since then she worked in an elementary school district, completed her Bachelor’s at a local Christian University, and discovered her true calling—writing novels. by Maggie Phillippi and Julie Bihn. 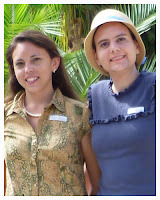 Julie and Maggie met through the magic of the Internet and became fast friends and writing partners. Julie spends her days writing strongly-worded letters at a law firm. Her favorite things include Disneyland, costuming, sewing, and wandering the Internet. She believes every story should have a happy ending. Maggie loves reading books on the beach. When she’s not writing about far off places, she’s on the stage pretending to be someone else. She co-teaches children’s theatre and does design work for several websites part time. She’s owned by seven wonderful kitties. I'm so excited to sit down with the authors next week to find out what makes them tick, what motivates them, and how writing thier books have changed them. Join the conversation and leave a comment, tweet or facebook mention your thoughts about COTT's Almost Kiss Clash. Welcome to all three authors! The more the merrier, I always say. Your excerpts were def sigh-worthy and I've added both books to my TBR pile! Nice to meet all three of you. Both books sound so interesting. I love mysteries, so solving one to protect an innocent person appeals to me. 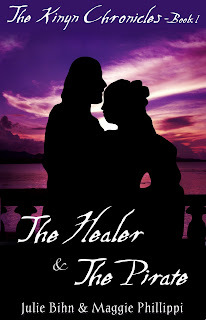 I'm also fascinated with the healer who goes off to help someone then meeting up with bandits. Thank you so much for hosting us, you all! These are terrific, but I really love Thyme for Love! Love both excerpts. Especially the first one. I LOVE A Thyme For Love! 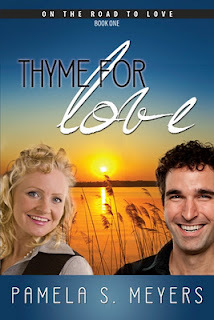 Read A Thyme for Love--wonderful! Hey, I just realized you can buy "A Thyme for Love" and "The Healer and the Pirate" in print on Amazon for $25, and should get free shipping if you buy them together! I love to read and would love to win this book.